.NET Core 3.0 downloads for Linux, macOS, and Windows. .NET Core is a cross-platform version of .NET, for building apps that run on Linux, macOS, and Windows. E: Package Microsoft.NETCore.App matching version [3.0.0-preview-27324-5] was not found in any repositories. 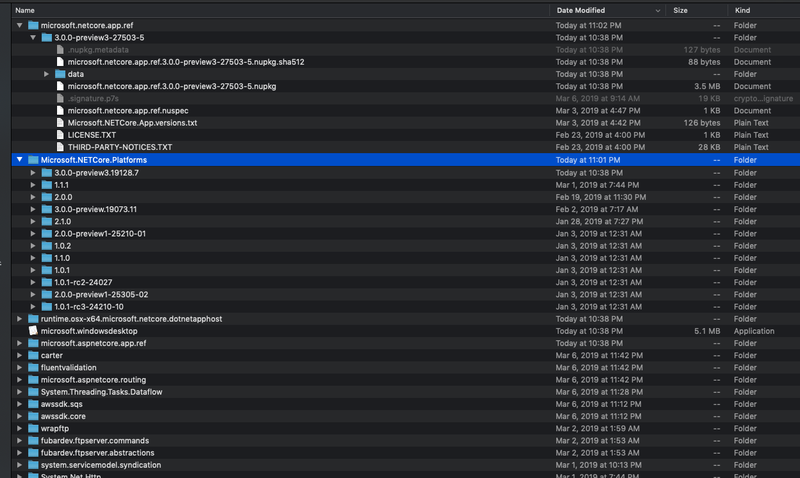 Version 10.0.0.2369 (develop) built on talax, 20190201-190555. Commit ea53b4b. -> Task RemObjects.EBuild.Elements.ElementsBuildProject started for ConsoleApplication2. -> Task RemObjects.EBuild.Elements.ElementsApplyLegacySettings started for ConsoleApplication2, Echoes. <- Task RemObjects.EBuild.Elements.ElementsApplyLegacySettings finished for ConsoleApplication2, Echoes, took 0.2359s (0.2372s). -> Task RemObjects.EBuild.Elements.ElementsSanityCheck started for ConsoleApplication2, Echoes. <- Task RemObjects.EBuild.Elements.ElementsSanityCheck finished for ConsoleApplication2, Echoes, took 0.0003s (0.0007s). -> Task RemObjects.EBuild.Elements.ElementsPreparePlatforms started for ConsoleApplication2. Preparing target ‘Echoes’ (platform ‘Echoes’). -> Task RemObjects.EBuild.Elements.ElementsPreflightEchoes started for ConsoleApplication2. <- Task RemObjects.EBuild.Elements.ElementsPreflightEchoes finished for ConsoleApplication2, took 0.0063s (0.0066s). -> Task RemObjects.EBuild.Elements.ElementsPrepareEchoesPlatform started for ConsoleApplication2, Echoes. Adding implicit package reference to ‘Microsoft.NETCore.App:[3.0.0-preview-27324-5]’. <- Task RemObjects.EBuild.Elements.ElementsPrepareEchoesPlatform finished for ConsoleApplication2, Echoes, took 1.0029s (1.0105s). <- Task RemObjects.EBuild.Elements.ElementsPreparePlatforms finished for ConsoleApplication2, took 1.2582s (1.2597s). -> Task RemObjects.EBuild.Elements.ElementsResolveSourceFiles started for ConsoleApplication2, Echoes. <- Task RemObjects.EBuild.Elements.ElementsResolveSourceFiles finished for ConsoleApplication2, Echoes, took 0.0069s (0.0076s). – Task RemObjects.EBuild.Elements.ElementsResolveHeaderImportFiles skipped for ConsoleApplication2, Echoes, condition not met. -> Task RemObjects.EBuild.Elements.ElementsPreCompile started for ConsoleApplication2, Echoes. -> Task RemObjects.EBuild.Elements.ElementsPreCompileEchoes started for ConsoleApplication2, Echoes. -> Task RemObjects.EBuild.Elements.ElementsResolveContent started for ConsoleApplication2, Echoes. <- Task RemObjects.EBuild.Elements.ElementsResolveContent finished for ConsoleApplication2, Echoes, took 0.0005s (0.0007s). 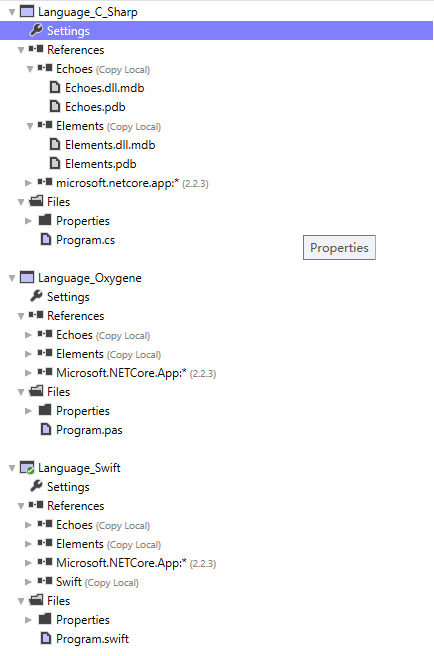 -> Task RemObjects.EBuild.Elements.ElementsResolveResourceFiles started for ConsoleApplication2, Echoes. <- Task RemObjects.EBuild.Elements.ElementsResolveResourceFiles finished for ConsoleApplication2, Echoes, took 0.0004s (0.0006s). -> Task RemObjects.EBuild.Elements.ElementsEchoesProcessResources started for ConsoleApplication2, Echoes. D: Using cached data for EchoesResources. <- Task RemObjects.EBuild.Elements.ElementsEchoesProcessResources finished for ConsoleApplication2, Echoes, took 0.0345s (0.0364s). -> Task RemObjects.EBuild.Elements.ElementsEchoesResolveXamlFiles started for ConsoleApplication2, Echoes. <- Task RemObjects.EBuild.Elements.ElementsEchoesResolveXamlFiles finished for ConsoleApplication2, Echoes, took 0.0002s (0.0007s). – Task RemObjects.EBuild.Elements.ElementsEchoesGenerateVBMyClass skipped for ConsoleApplication2, Echoes, condition not met. <- Task RemObjects.EBuild.Elements.ElementsPreCompileEchoes finished for ConsoleApplication2, Echoes, took 0.0001s (0.0400s). – Task RemObjects.EBuild.Elements.ElementsPreCompileToffee skipped for ConsoleApplication2, Echoes, condition not met. – Task RemObjects.EBuild.Elements.ElementsPreCompileCooper skipped for ConsoleApplication2, Echoes, condition not met. – Task RemObjects.EBuild.Elements.ElementsPreCompileIsland skipped for ConsoleApplication2, Echoes, condition not met. <- Task RemObjects.EBuild.Elements.ElementsPreCompile finished for ConsoleApplication2, Echoes, took 0.0000s (1.7168s). – Task RemObjects.EBuild.Elements.ElementsPreparePlatforms skipped for ConsoleApplication2, already ran. -> Task RemObjects.EBuild.Elements.ElementsCheckForTargetlessReferences started for ConsoleApplication2. <- Task RemObjects.EBuild.Elements.ElementsCheckForTargetlessReferences finished for ConsoleApplication2, took 0.0008s (0.0013s). -> Task RemObjects.EBuild.Elements.ElementsResolveReferences started for ConsoleApplication2. -> Task RemObjects.EBuild.Elements.ElementsProcessNuGetReferences started for ConsoleApplication2, Echoes. <- Task RemObjects.EBuild.Elements.ElementsProcessNuGetReferences failed for ConsoleApplication2, Echoes, took 0.5044s (0.5052s). <- Task RemObjects.EBuild.Elements.ElementsResolveReferences failed for ConsoleApplication2, took 0.5106s (0.5130s). <- Task RemObjects.EBuild.Elements.ElementsBuildProject failed for ConsoleApplication2, took 0.0000s (2.2343s). <- Project ConsoleApplication2 failed, took 2.2348s. Project ‘ConsoleApplication2’ failed to build. Solution ‘ConsoleApplication2’ failed to build all projects. <- Task RemObjects.EBuild.BuildSolution failed for ConsoleApplication2, took 2.9112s (2.9144s). Package Microsoft.NETCore.App matching version [3.0.0-preview-27324-5] was not found in any repositories. pretty self-explanatory? guess that backache just isn’t there for the preview? I looked in .nuget and couldnt see it there. I also did a dotnet new console and then a dotnet run which worked ok.
Where did it look for that package ? It should look like this, you can see the yellow ! is gone (for the last screenshot). D:          Available Versions of 'Microsoft.NETCore.App': 2.2.3, 2.2.2, 2.2.1, 2.2.0, 2.2.0-preview3-27014-02, 2.2.0-preview2-26905-02, 2.2.0-preview-26820-02, 2.1.9, 2.1.8, 2.1.7, 2.1.6, 2.1.5, 2.1.4, 2.1.3, 2.1.2, 2.1.1, 2.1.0, 2.1.0-rc1, 2.1.0-preview2-26406-04, 2.1.0-preview1-26216-03, 2.0.9, 2.0.7, 2.0.6, 2.0.5, 2.0.4, 2.0.3, 2.0.0, 2.0.0-preview2-25407-01, 2.0.0-preview1-002111-00, 1.1.12, 1.1.11, 1.1.10, 1.1.9, 1.1.8, 1.1.7, 1.1.6, 1.1.5, 1.1.4, 1.1.2, 1.1.1, 1.1.0, 1.1.0-preview1-001100-00, 1.0.15, 1.0.14, 1.0.13, 1.0.12, 1.0.11, 1.0.10, 1.0.9, 1.0.8, 1.0.7, 1.0.5, 1.0.5-servicing-004880-00, 1.0.4, 1.0.3, 1.0.1, 1.0.0, 1.0.0-rc2-3002702. D:          Package Microsoft.NETCore.App version [3.0.0-preview3-27503-5] could not be matched in repository <NuGetRepository https://api.nuget.org/v3/index.json>. D:          Package Microsoft.NETCore.App matching version [3.0.0-preview3-27503-5] was not found in any repositories; trying different versions. 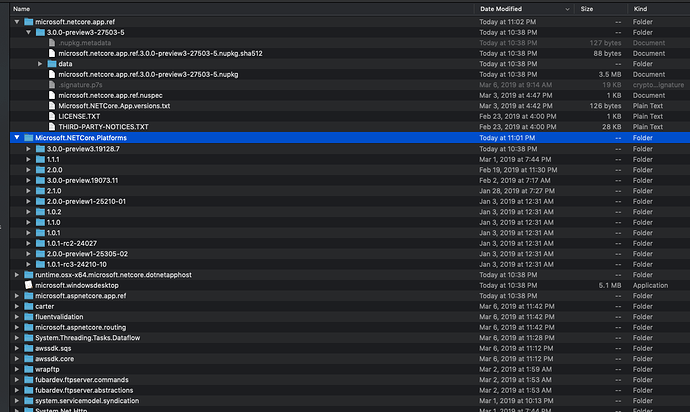 D:          Package Microsoft.NETCore.App:2.2.0 found in local cache. which seems to be the best possible outcome, given a newer version of the package actually does not exist in the repo? Ah wait, that fallback only applies to reference resolving; actual build expects a hard match. John, which version of the package does botnet resolve, for you? I dont recall what I installed last time. -> Task RemObjects.EBuild.Elements.ElementsBuildProject started for ConsoleApplication4. -> Task RemObjects.EBuild.Elements.ElementsApplyLegacySettings started for ConsoleApplication4, Echoes. <- Task RemObjects.EBuild.Elements.ElementsApplyLegacySettings finished for ConsoleApplication4, Echoes, took 0.0131s (0.0141s). -> Task RemObjects.EBuild.Elements.ElementsSanityCheck started for ConsoleApplication4, Echoes. <- Task RemObjects.EBuild.Elements.ElementsSanityCheck finished for ConsoleApplication4, Echoes, took 0.0002s (0.0004s). -> Task RemObjects.EBuild.Elements.ElementsPreparePlatforms started for ConsoleApplication4. -> Task RemObjects.EBuild.Elements.ElementsPreflightEchoes started for ConsoleApplication4. <- Task RemObjects.EBuild.Elements.ElementsPreflightEchoes finished for ConsoleApplication4, took 0.0058s (0.0060s). -> Task RemObjects.EBuild.Elements.ElementsPrepareEchoesPlatform started for ConsoleApplication4, Echoes. Adding implicit package reference to ‘Microsoft.NETCore.App:[3.0.0-preview3-27503-5]’. <- Task RemObjects.EBuild.Elements.ElementsPrepareEchoesPlatform finished for ConsoleApplication4, Echoes, took 0.0243s (0.0309s). <- Task RemObjects.EBuild.Elements.ElementsPreparePlatforms finished for ConsoleApplication4, took 0.0419s (0.0428s). -> Task RemObjects.EBuild.Elements.ElementsResolveSourceFiles started for ConsoleApplication4, Echoes. <- Task RemObjects.EBuild.Elements.ElementsResolveSourceFiles finished for ConsoleApplication4, Echoes, took 0.0058s (0.0065s). – Task RemObjects.EBuild.Elements.ElementsResolveHeaderImportFiles skipped for ConsoleApplication4, Echoes, condition not met. -> Task RemObjects.EBuild.Elements.ElementsPreCompile started for ConsoleApplication4, Echoes. -> Task RemObjects.EBuild.Elements.ElementsPreCompileEchoes started for ConsoleApplication4, Echoes. -> Task RemObjects.EBuild.Elements.ElementsResolveContent started for ConsoleApplication4, Echoes. <- Task RemObjects.EBuild.Elements.ElementsResolveContent finished for ConsoleApplication4, Echoes, took 0.0007s (0.0010s). -> Task RemObjects.EBuild.Elements.ElementsResolveResourceFiles started for ConsoleApplication4, Echoes. <- Task RemObjects.EBuild.Elements.ElementsResolveResourceFiles finished for ConsoleApplication4, Echoes, took 0.0009s (0.0011s). -> Task RemObjects.EBuild.Elements.ElementsEchoesProcessResources started for ConsoleApplication4, Echoes. <- Task RemObjects.EBuild.Elements.ElementsEchoesProcessResources finished for ConsoleApplication4, Echoes, took 0.0086s (0.0117s). -> Task RemObjects.EBuild.Elements.ElementsEchoesResolveXamlFiles started for ConsoleApplication4, Echoes. <- Task RemObjects.EBuild.Elements.ElementsEchoesResolveXamlFiles finished for ConsoleApplication4, Echoes, took 0.0002s (0.0007s). <- Task RemObjects.EBuild.Elements.ElementsPreCompileEchoes finished for ConsoleApplication4, Echoes, took 0.0001s (0.0149s). – Task RemObjects.EBuild.Elements.ElementsPreCompileToffee skipped for ConsoleApplication4, Echoes, condition not met. – Task RemObjects.EBuild.Elements.ElementsPreCompileCooper skipped for ConsoleApplication4, Echoes, condition not met. – Task RemObjects.EBuild.Elements.ElementsPreCompileIsland skipped for ConsoleApplication4, Echoes, condition not met. <- Task RemObjects.EBuild.Elements.ElementsPreCompile finished for ConsoleApplication4, Echoes, took 0.0000s (0.0856s). – Task RemObjects.EBuild.Elements.ElementsApplyLegacySettings skipped for ConsoleApplication4, Echoes, already ran. – Task RemObjects.EBuild.Elements.ElementsPreparePlatforms skipped for ConsoleApplication4, already ran. -> Task RemObjects.EBuild.Elements.ElementsCheckForTargetlessReferences started for ConsoleApplication4. <- Task RemObjects.EBuild.Elements.ElementsCheckForTargetlessReferences finished for ConsoleApplication4, took 0.0008s (0.0014s). -> Task RemObjects.EBuild.Elements.ElementsResolveReferences started for ConsoleApplication4. -> Task RemObjects.EBuild.Elements.ElementsProcessNuGetReferences started for ConsoleApplication4, Echoes. E: Package Microsoft.NETCore.App matching version [3.0.0-preview3-27503-5] was not found in any repositories. <- Task RemObjects.EBuild.Elements.ElementsProcessNuGetReferences failed for ConsoleApplication4, Echoes, took 0.0215s (0.0223s). <- Task RemObjects.EBuild.Elements.ElementsResolveReferences failed for ConsoleApplication4, took 0.0290s (0.0313s). <- Task RemObjects.EBuild.Elements.ElementsBuildProject failed for ConsoleApplication4, took 0.0000s (0.1225s). <- Project ConsoleApplication4 failed, took 0.1231s. Project ‘ConsoleApplication4’ failed to build. Solution ‘ConsoleApplication4’ failed to build all projects. <- Task RemObjects.EBuild.BuildSolution failed for ConsoleApplication4, took 0.1380s (0.1405s). right. but what version of the package does a vc# project use! given that the missing version 3.0 actually does not exist? dwhere is that, inside the core install? Ok, but where did it get there from? If you clear the .nuget/packages folder and rebuild a vc# app, where does it get that package? Hmm. Microsoft.NETCore.App.Ref. they changed the name to .ref? lovely. an entirely new package format, too. god, Microsoft can not not make a mess of things for 5 minutes, can they? Latest firehose has this fix merged, btw.